Although there may be many different times that we get together with friends and family, there are going to be those special times that really stand out in your mind. One of those is when we have the opportunity to share in a baby shower, one of the most important days in the life of a pregnant woman. If you have the opportunity to share with somebody during that special day, it is a good idea to make things as special as possible. That is what you will do when you make these baby booty candy bowls. They may be a rather simplistic DIY item but once you put them out at the baby shower, you will find that people are loving it from that point forward. You may even have a lot of people asking you how you did it so they can pass on the tradition. Baby showers are a rather interesting and unique event. At one time, they were limited to only women in the circle of family and friends but today, even the men are getting involved. It is an opportunity to show the person that is having a baby that you really care about them and you want to ensure that they do the best in life that they possibly can. They will often put things up on a registry and you can choose your gift directly from that registry. Don’t overlook the possibility, however, of doing something extra special on that day. These baby booty Candy Bowls are not only cute, they are also going to provide a sweet treat that many of the guests are going to enjoy. Be sure that you have these on all the tables and it really will make a difference in the enjoyment of the party. Set your tissue paper out flat. Place a balled up piece of tissue paper beside a plastic cup in the center. Wrap the tissue paper into the cup, the extra tissue ball will make the toes for your bootie. Once all the edges are tucked in, use another plastic cup to hold them in place by sliding it into the cup. Tie a ribbon around the bootie so it will look like laces. Cut a little half circle out of paper and glue it to the “toe” of the bootie. 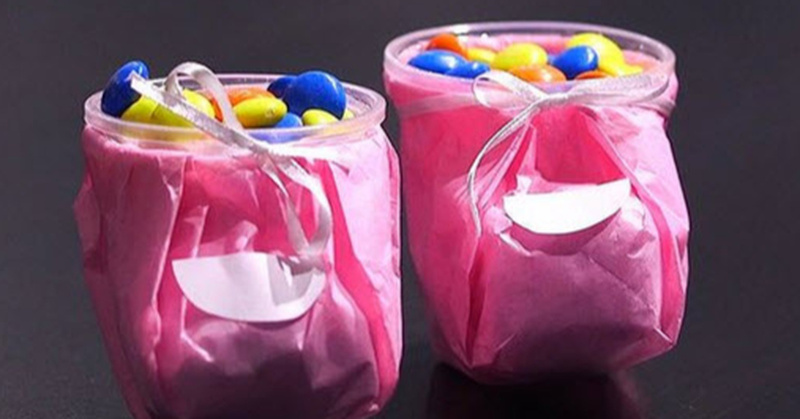 Fill the cup with small candies and they will make be the cutest decorations at the party!